This recipe was sent to me by reader Dana Jago of Loudon, Tennessee, who writes: “My mom made these cookies at Christmas when I was a child. They were always my favorite!” I have made them many times (and not just for Christmas!) and they are now a favorite of mine too. 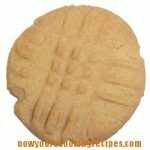 This also makes a great plain peanut butter cookie if you make it without the kisses. 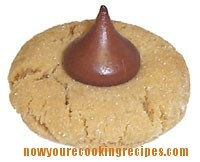 One of our most popular recipes, soft chewy peanut butter cookie with a chocolate kiss on top. Make balls out of level tablespoons of dough - add flour if needed. Roll in sugar. It will become soft, yes. This helps it stick to the cookie. It will harden again when the cookie becomes cool. How many dozen of cookies does this recipe make? Around 4-5 dozen, depending on how big you make them. 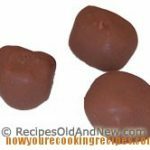 If I remove the PB from the recipe, do I need to alter any other ingredients?